Trend alert! Modern brides that are looking for clean and classic designs to achieve full confidence on their big day, look no further because these BHLDN wedding dresses provide the perfect fashion-forward inspiration! These gorgeous bridal gowns are more than just classy, they’re simplistic and sophisticated fashion with a twist. 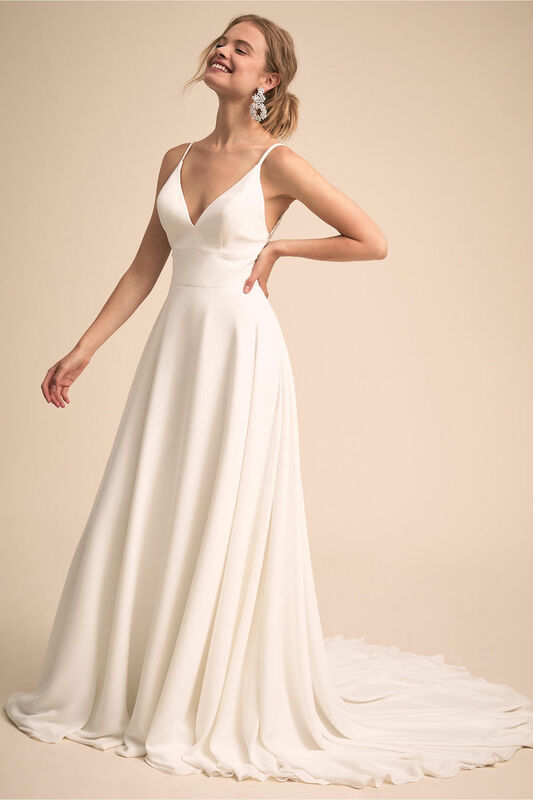 From engagement shoot to wedding reception, the looks from BHLDN keep us inspired with chic silhouettes, clean lines and sleek contours, including unique options like the Mara Jumpsuit or a little white dress like the Barrett Dress! Today’s bride can feel polished in an elegant minimalist gown like the Beloved Gown, Octavia Gown or Sawyer Gown, which all have flattering shapes. For a glam-worthy reception or rehearsal dress, the Iva Crepe Maxi or Goldie Dress are both versatile options that you can keep in your wardrobe for another fabulous occasion. BHLDN is one of our favorites when it comes to bridesmaids dresses, featuring plunging necklines, feminine fits and daring open backs. So don’t be surprised when your girls swoon over the Madison Dress, Jones Dress and more stylish looks for the modern ‘maid. Keep reading to be inspired by more of these easy-to-love BHLDN wedding dresses.